I don’t really remember ﻿ever not sewing or it at least not being a part of my life. The blue dress was an Easter dress for me at about 21 months. 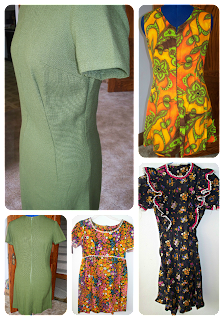 I have several dresses (as well as a few of those patterns) that my Grandmother made for my aunts in the 60’s and/or 70’s; as well as all of Grandma’s pattern stash – really not sure how I, of all the 40+ grandkids, ended up with them but YAY!!!! My Grandmother did tell me once that she was not much of a seamstress until her sister had sewn a couple of dresses for my aunts and so Grandma decided she better start sewing. When I was in second grade, maybe third grade, I begged my mother to teach me how to sew by hand, so I started out with hand sewing, I didn’t do much with it- too slow! While I was in fourth grade we lived with my Grandparents for a few months and I know I hounded my Grandma into teaching me to sew with her sewing machine. I still have a few of the items I made – a little yellow drawstring bag and and recorder cover plus I know I made a birthday gift for my sister but can’t recall what. For Christmas in fifth grade my parents got me a second hand Kenmore sewing machine and the doll clothing pattern, Simplicity 9478. 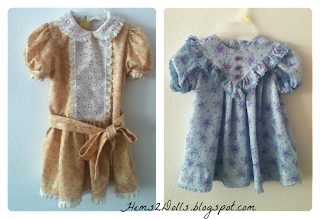 I still have the nightgown, cape and muff, and dress – put away for now, don’t trust B quite yet with my handmade doll clothes. I was the only one in home ec. class in middle school that already knew how to sew, so my teacher put me on the finiky machine. Through middle school I did make the occasional pillow and blanket but not much else that I recall. In ninth grade I took an interior design class in which, for our midterm project, we had to decorate a room of our house. I did my bedroom, of course, – I recovered my comforter, made roman shades, and large pillows- all in coordinating fabric. 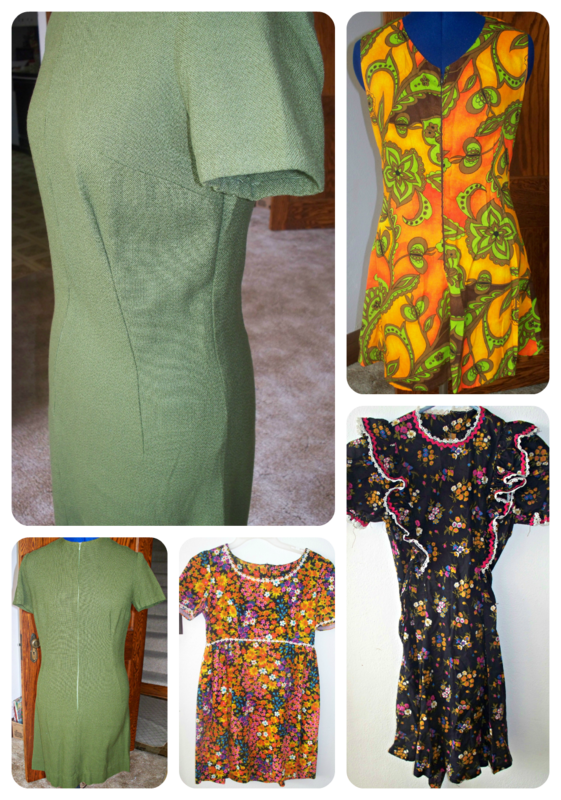 That year I also made the dress I wore to the homecoming dance – a green sleeveless dress out of quilting cotton – not the best but I still love the prints (have some scraps tucked away that I use here & there). Through high school I mostly made home decor items – curtains, pillows, etc. ; though I did make myself a couple of renaissance fair dresses and a cloak – what can I say I love costumes! I didn’t get serious about making my own clothing until a few years ago when I needed clothing that was breastfeeding friendly. I found Blessed Designs, which is where I first started finding the whole sewing blogoshere! I was able to get a few of those patterns sewn up – the lingerie/nightgown pattern was indispensable while nursing and the diaper bag is still a great big bag. 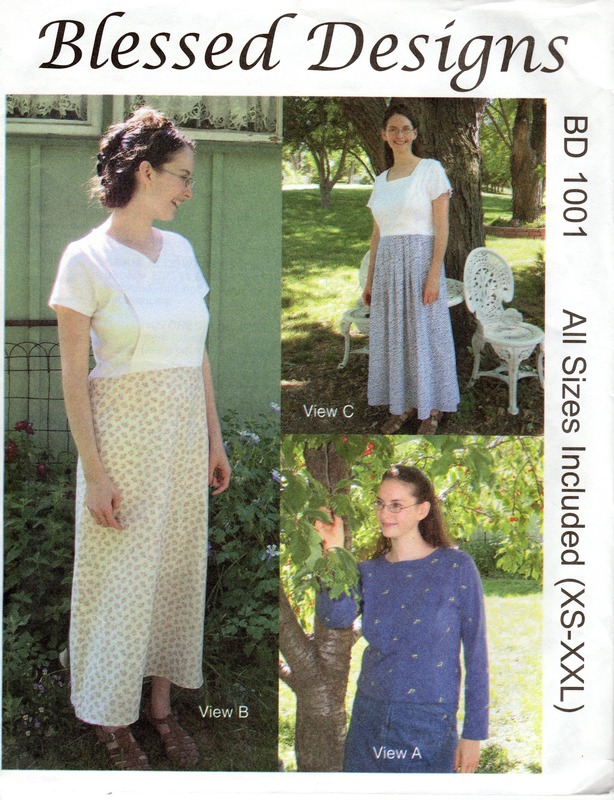 I did sew up a couple of the dresses but now that my family is no longer growing the patterns are sitting idle in my stash – soooo, who wants to win a pattern? 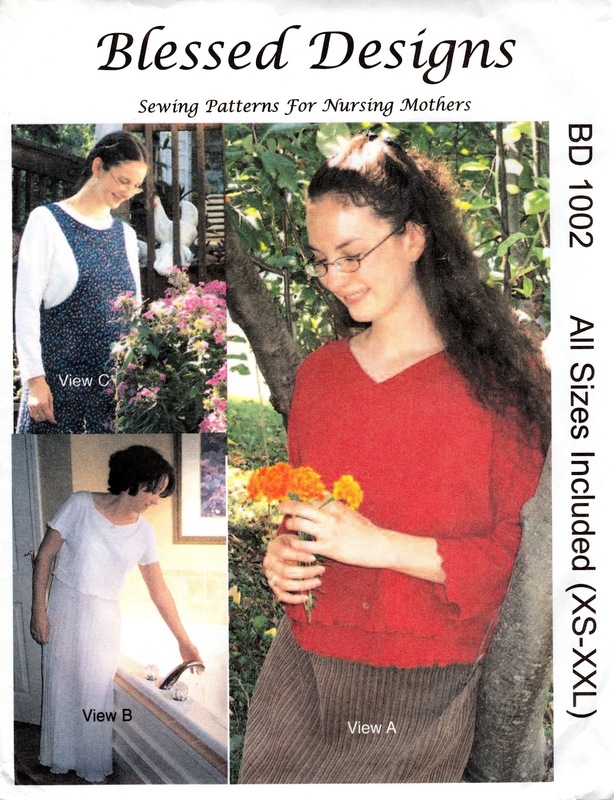 Leave a comment at the end of my post and two lucky winners will win one of these nursing dress/top patterns. On October 1st, I will use random.org to pick two winners. With lots of sewing blog lurking and sewing book reading I have learned much about sewing and done a lot more garment sewing the last three years than I did ever before. By sewing more for myself I have begun to find and develop my own style which is giving me more confidence in myself, I’m not just known as D and B’s mom but also as a seamstress. I get compliments on my clothing, as well as the odd look but when it isn’t common place for women to wear dresses or skirts on a daily basis then it is to be expected. When I go to town I don’t want people to look at me and guess that I am a stay at home mom just because of what I am wearing, I’m not one to wear the ill fitting t-shirt and jeans or work-out clothes; I’d much rather be dressed nicely in one of my self-made dresses or skirt and blouse ensemble even if I look a bit vintage or maybe even out of place at the park in a dress, hat, and nice shoes. I do what I can to make sewing a money saving hobby especially since I don’t have an income of my own but there are the occasional projects that I do actually have to go shopping for a portion of the supplies.Usually though I can “stash shop” (as shown with Vintage Lined Jacket, New Look 6808, Bustier Top and nearly every other sewing project on my blog) or refashion some piece of clothing, as was the case with Great Grandpa’s shirts, B’s Go To Tunic, Yellow Shirt dress, and Purple T-shirt to name a few. I really do love to sew. My children know this and request items – especially B (who is 3yrs old)- but I always get so much satisfaction from that huge smile & big thank you when I give her the item (just last week she was so happy to get her requested Strawberry School Bag), that I can’t say no. My son D (who is 5) has started learning to sew on my old machine (after much hounding of me on his part) – just needle & paper- and he is getting the hang of it; B was very disappointed that she couldn’t sew too. It makes me proud to think that I will be able to pass on a skill learned from my mother and grandmother to my children and so on. So maybe to summarize my very long and rambling post: I am finding that sewing is a great outlet for self expression, individualism, provides a connection to the past, and can be a great confidence booster – how about you? Hi! I am a stay-at-home mom to my two beautiful children, son D who is 5 and just started Kindergarten and daughter B who is 3 and just started preschool. My husband and I have been married 10 years and live in rural, southwest Minnesota. My husband owns his own business which makes it possible for me to stay at home. 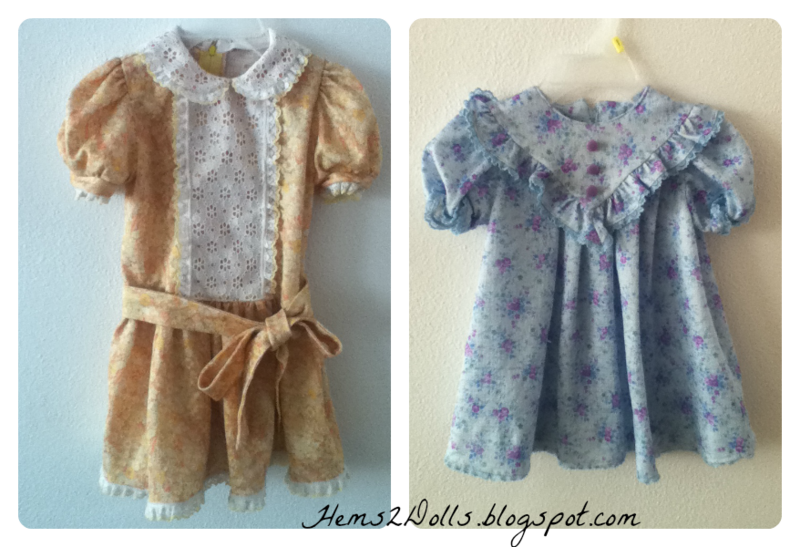 I love to sew! When I was 7 or 8 I pestered my mom into teaching how to sew by hand then at 9 I hounded my grandma into teaching me to sew with her sewing machine. I sewed off and on since then but in the last three years have really picked it back up and started sewing with more intent – less home decor or accessories/gifts and lots more garments. 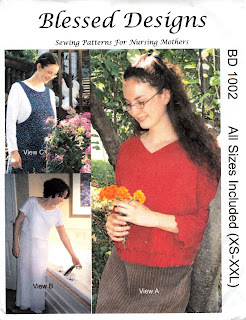 I have learned so much in the last few years between reading all the lovely sewing blogs out there and reading sewing books, as well as just sewing to see what works. 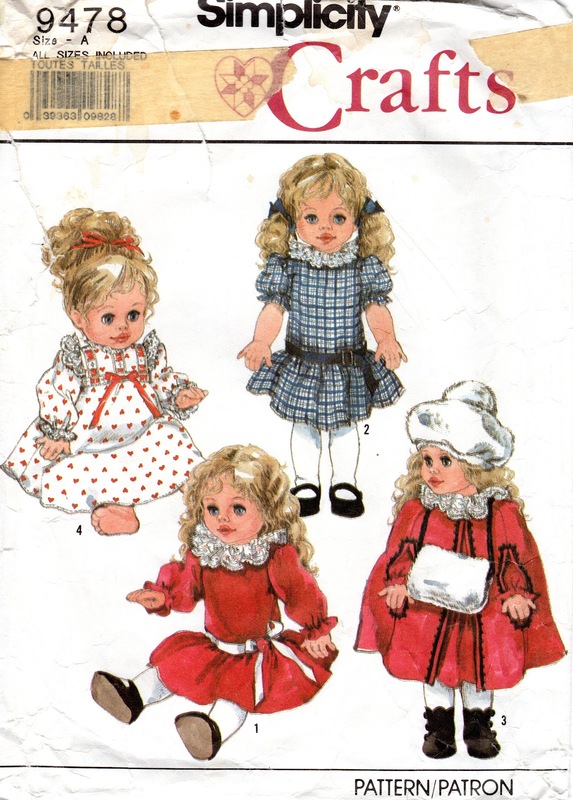 I love the vintage styles that are becoming more popular plus I have my mom and grandma’s pattern stash from the late 60’s and 70’s- the little girls’ patterns are so cute, the dresses are a little short but cute. So I love to sew, helps me keep my sense of self and accomplishment. I look forward to passing on the appreciation of handmade and the skills and love of sewing to both my children. I love the access the internet offers us to learn and connect with others so please feel free to connect I am always happy to make new crafty friends!